presso St Ninian's Church, ​Puriri Street, Riccarton, Christchurch, Nuova Zelanda. 2016 began with another in our series on Italian regional cooking. This time Wilma Laryn presented various recipes with eggplants. Thanks Wilma. As usual in March we had a stall with a fluttering Italian flag at Culture Galore where we had a successful day selling Italian cakes and coffee. We celebrated the Festa della Repubblica in June with a wonderful concert in the pro-cathedral of St Mary before an audience of more than 300. 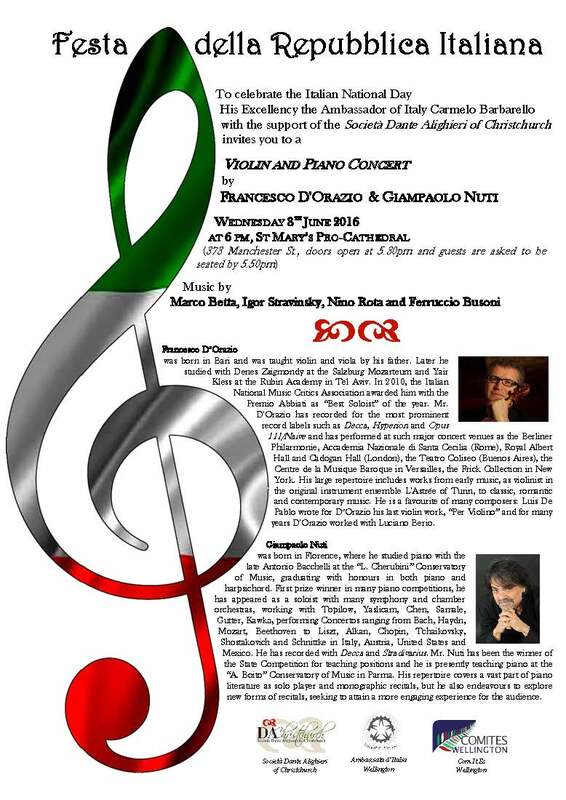 I would like to thank HE Mr Carmelo Barbarello and the Istituto di Cultura Italiana, Sydney, who made possible this concert given by the duo Francesco D’Orazio e Giampaolo Nuti. After the concert a reception for guests was hosted by the Ambassador, I want also to particularly thank Marco Casamassima e Vladimiro Cesari of Italian Food Philosophy Ltd for the delicious stuzzichini they provided. The evening was also an opportune moment in which to thank Sig.ra Cav. Valerie Carmana Mayer for her many years of service as the Italian consular agent Christchurch and also in which to welcome Sig. Belfiore Bologna, the new consular agent. In the first semester of 2016 the Society held 8 classes of Italian with four different levels for 65 students, In the second semester there weere 7 classes of four levels for 49 students. The teachers for 2016 were Wilma Laryn and Maria Fresia. In 2016 we recieved a grant of $900 from the Christchurch City Council to assist in our work promoting Italian language and culture in Christchurch. In conclusion I would like to thank members of the committee for all their work during the course of the year. We will look forward to the Dante continuing its role as punto di riferimento, for things Italian in our city. ​The new Committee for 2017 has been elected. We farewell Fiorenzo Peloso with many thanks for the support and work he’s offered the Dante over the last 15 years. While we all wish him well, we will look forward to his always genial company at future occasions of the Dante, and perhaps once again on the committee. Also we welcome new entrants to the Committee: Viv Browne, Lorenzo Maddaluno and Silvia Maggioni. Should more members wish too join the Committee, we could easily co-opt them at one of our meetings.